Matt ‘Sin’ Sinclair I’m the middle child born into Devil’s Fury MC. Club life was in my blood, I was expected to carry on like my father did, like my brother, but it wasn’t me. Wanting a life away from the MC, I joined the military after high school, becoming nothing more than a grunt in the Marines. Military life was hard, and war was something I didn’t expect. People called me a hero for defending my country, but I felt more like a coward. A hero wouldn’t have shrapnel scars on his back, proving he was running away from the fight instead of facing it. If I was a hero then why didn’t I save my sister?Savannah Brooks I was raised by a working class family in the midst of oil country, Texas. Catching the eye of an older man, the son of oil royalty, I thought I found love. But I was wrong. He wanted me on his arm, to make him look good, just as a woman should. I wanted to be heard, for my opinion to matter. The first strike of his hand across my face should’ve been evidence enough that my life wasn’t turning out as I had hoped. Getting smacked around became the norm. 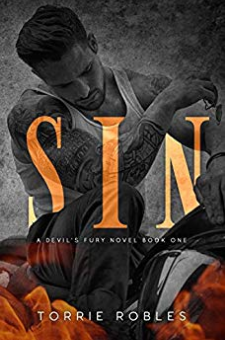 I thought I was stuck in a life I couldn’t control, but the life I found growing inside of me gave me the strength I needed.Sin & Savannah Two people broken. Two people living a life they didn’t want. Two people thrown together To keep each other safe;One from their past, and one from their own misery. Can he rectify a past tragedy? Can she be his salvation?